A graphic rom the book “Are you my mother” by Alison Bechdel. Three bracing new graphic novels confront the distorting effects of physical and emotional boundaries inside families, peer groups, and a divided city. Each delineates the stunting effects of separateness with power, insight, and varying shades of dark humor. Alison Bechdel’s memoir “Are You My Mother?” borrows its title from P. D. Eastman’s classic children’s book of the same name about an abandoned baby bird who goes in search of its mother. Bechdel is a grown woman asking the question of her real, but emotionally unavailable, mother. The two talk frequently, and Bechdel compulsively transcribes their conversations as she has for years. 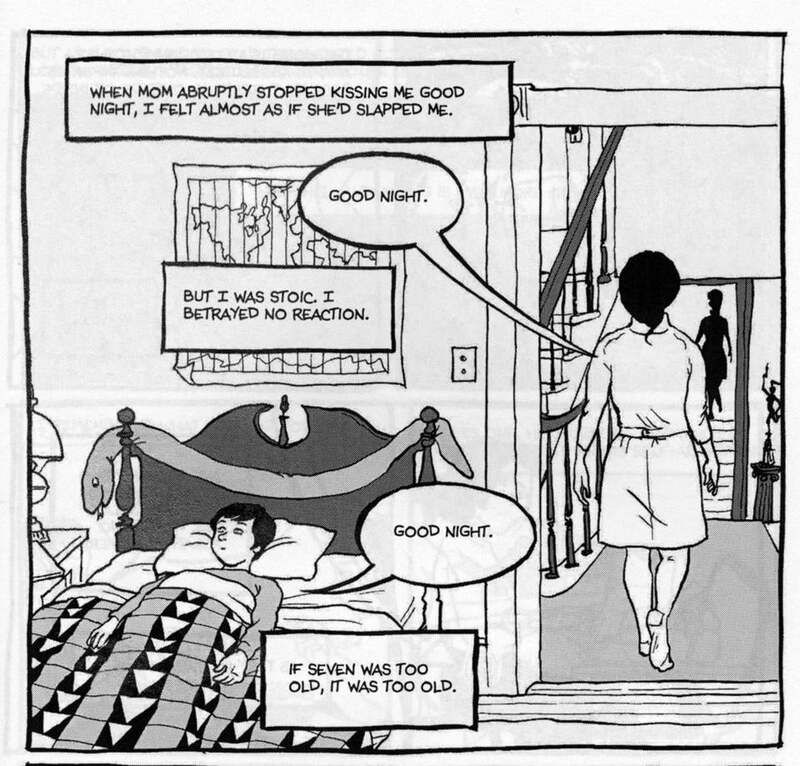 Bechdel plumbed her childhood journals to pen her first spectacular graphic memoir, “Fun Home,’’ which recounted her coming out as a lesbian, her father’s closeted homosexuality, and his suicide at age 44. This volume focuses on her relationship with her mother, particularly her reaction to “Fun Home.” It is as arresting and engaging as the earlier work and graphically more powerful. The line work is bolder, looser, and more confident, and the use of washes adds weight and texture to the pages. As Bechdel examines her life, she summons the work of Jung, Freud, Dr. Spock, and others to help sort things out. But she finds the ideas of British pediatrician and psychoanalyst D. W. Winnicott particularly useful. It is challenging material, and in other hands (or another pen) it might bog down, but Bechdel’s honesty and wit guide the reader through Winnicott’s concepts and her own years in therapy. As she reconstructs her family’s life, Bechdel explicates Winnicott’s theory of childhood development, his concepts of the “good enough mother,” “transitional objects,” and the human capacity, despite psychic damage and disappointment, for “going on being.” Complex, funny, and ultimately affirming, the book is another masterpiece of graphic storytelling. Winnicott also wrote about homes that were “not good enough,” where emotionally deprived children grow up insecure and unmoored. “My Friend Dahmer,” by Derf Backderf, only hints at the early deprivations of serial killer Jeffrey Dahmer, but it tracks in detail his descent from disturbed teen to homicidal madman. Backderf, an alternative cartoonist best known for his strip, “The City,” went to middle and high school with Dahmer and knew him as a fellow “nerd” who played trumpet in the high school band. He occasionally visited Dahmer’s house and parents. Backderf’s account of the boy’s unraveling is neither sensational nor an attempt to excuse Dahmer. It is bracingly frank about Dahmer’s isolation, his fascination with road kill, his mother’s mental illness, and the inability or unwillingness of teachers, parents, or peers to respond to his spiral into psychosis. The setting is a 1970s, overcrowded, regional high school in Ohio, and the drawings convey the clammy, pulsing anxieties of adolescence and the cruelties of its social hierarchy. His panels are heavy, moody, and muscular, populated with bodies that look as if built out of bulging sausages. Dahmer finds a social niche within the nerd subculture by throwing loud, random, fake fits, that, Backderf speculates, mocked both his mother’s seizures and the speech impediment of her palsied interior decorator. His routine serves as social currency in school as his peers, including Backderf, egg him on. They form a “Dahmer Fan Club” and adopt him as a “mascot” who performs his outrageous act at school and the local shopping mall. Appreciated only for his shock value, Dahmer is largely shunned by his “fan club” in other settings. Two weeks after their high school graduation, Dahmer commits his first murder. Brave high schools serious about their anti-bullying and mental health programs should put this book at the top of their reading lists. Derf Backderf’s book tracks in detail Jeffrey Dahmer’s descent from disturbed teen to homicidal madman. Guy DeLisle’s “Jerusalem” is not a personal memoir but a breath-taking chronicle of one year in the holy city, written by a visitor with insatiable curiosity and a sketchbook. DeLisle’s wife works for an international relief group, and they move into an East Jerusalem apartment with their two children. While she works, he takes care of the kids and sets out to find three things: a decent playground, a quiet place to draw his cartoons, and how the residents live in this riven city. He eventually succeeds in locating the first two. In his quest for the third, he finds more puzzles than solutions. He visits the holy sites of three religions, traverses neighborhoods carved up by political, religious, and military barriers, and tries to cope with a maddening maze of checkpoints, roadblocks, and prohibitions that shift with the hour of the day, the day of the week, and the side of the street. Wherever he goes, DeLisle draws, and the drawings are beautiful. Simple but rich, they capture the traffic jams, the claustrophobic markets, the sacred buildings, the settlers, the soldiers, and the massive security wall. They are populated with people who are alive in their warmth, their longing and their anger. DeLisle is an accomplished animator turned narrative cartoonist, and “Jerusalem” builds on the graphic chronicles he produced during earlier stays in North Korea, Burma, and China. Dan Wasserman is the Globe’s editorial cartoonist. He can be reached at wasserman@globe.com.